In this post, we will see how to schedule jobs using Spring Quartz scheduler or how to integrate spring with Quartz. We have already seen how to schedule jobs using Timer and TimerTask . There are two ways by which you can specify quartz jobs. MethodInvokingJobDetailFactoryBean is used for simpler task. It specifies target object and target method, so target object’s method will be executed at the time specified using trigger. 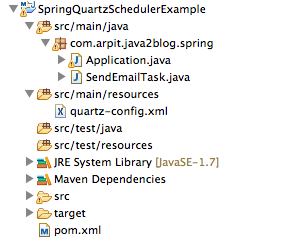 Create simple java maven project with Name “SpringQuartzSchedulerExample”. Update pom.xml to put spring core and spring quartz dependencies. Create a class called “SendEmailTask.java” in src/main/java in package com.arpit.java2blog.spring. It is class whose code you want to execute at specific time or time interval repeatedly. In this step, you need to create “quartz-config.xml” in src/main/resources. Need to specify task (SendEmailTask). Need to specify MethodInvokingJobDetailFactoryBean which specify class and method which will get executed. Need to put entry for triggers which specify time interval and start delay time. Need to specify ScheduleFactoryBean to bind triggers and MethodInvokingJobDetailFactoryBean together. We are done with Spring Quartz Scheduler Example using MethodInvokingJobDetailFactoryBean.